New lands and religions to explore and four adventures for OpenQuest. This book is also compatible with other D100 systems. Written by John Ossoway (author of River of Heaven / Cthulhu Rising) with setting info and cults by Newt Newport. Now in its revised re-release as “The Savage North: Director’s Cut” , which as well as another proofing pass, the removal of an extraneous meta-plot section sees the addition of 26 pages of new content to give players and GMs more options and guidance on playing the adventures. 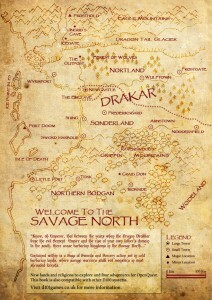 Guide to the Savage North. A new mini-setting filled with Tundra, Glaciers, Mountains and Barbarians. Although self contained it ties in with the setting in the OpenQuest rule book. The Barbarian Gods and the terrifying Blood Gods detailed with full cult write ups. 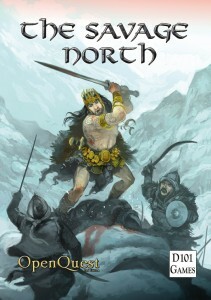 Adventurers are working as caravan guards, and arrive at northern trading post to find it ransacked. Hired to track bandits and bring them to justice. Adventurers meet priestess who is on quest to recover a magical artefact from the Sorceress daughter of a Frost Giant. Their Quest leads them into an ancient fortress half buried in a Glacier where even more ancient horrors awaken. A priest has been cursed and thinks he’s a pig. Has to be taken to the druids in Bogdan to have curse broken. An isle of riches untold and death in abundance. Six pregenerated characters to use directly in your games or as inspiration for your own characters. Copious advice on how to run the adventures based on several groups experience. Guideance on how to use the ready made concepts in the main rulebook with the setting, plus seven new concepts. Copiously illustrated and mapped by John Ossoway, with a cover by Jon Hodgeson. Colour cover A4 125 pages with black and white illustrations. 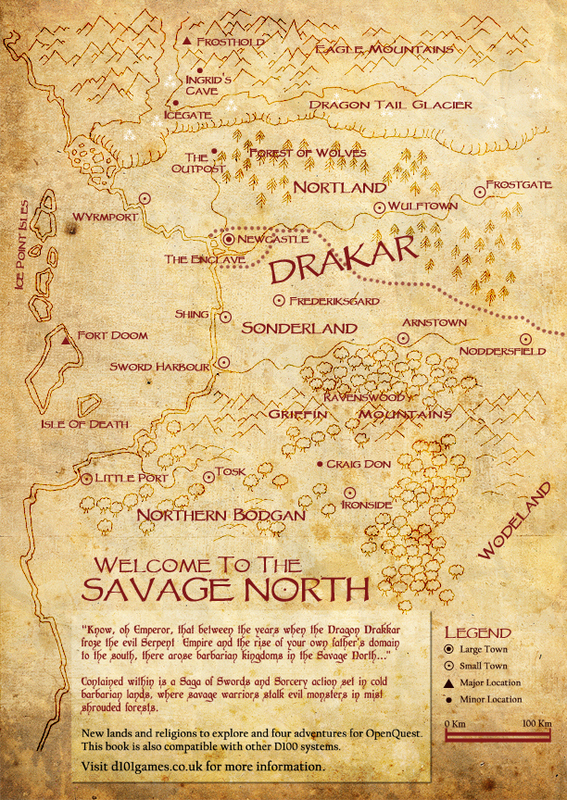 Like OpenQuest, Savage North is broadly compatible with other D100 systems. Director’s Cut release May 2014.